This paper could be called “pieces on recent trends ...”. 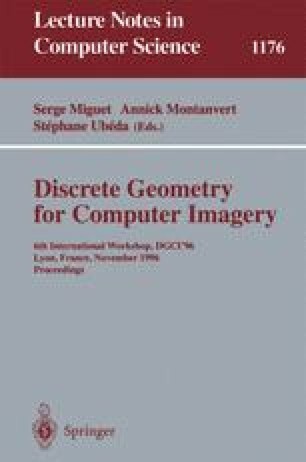 It is a set of remarks and thoughts about the actual and the potential development of discrete geometry; especially in computer imagery, and its interaction with geometrical modelling. My personnal view on some recent trends are exposed. It is rather a critical tutorial that emphasizes what I believe to be significative and promizing trends, among the enormous blossoming of researches and results. Thus, this paper is not a survey. Included remarks are particularly illustrated with papers taken from the DGCI conferences, from 1991 to 1996. General remarks are classified into three groups: On growing 3D discrete geometry: On the convergence of problems and their solutions in the subfields of image analysis and of computer graphics; On the trend toward more discrete geometry. These remarks end with some conclusions for future work. In a second part, the actual and the potential importance of combinatorial topology, arithmetic geometry, discrete linearity and piecewise linearity is studied and discussed. Conclusions, directions. and problems for future work are stated.